Not far from Putney High Street on Lacy Road sits Blåbär Nordic Living, a sort of hybrid coffee shop, cafe and lifestyle store. 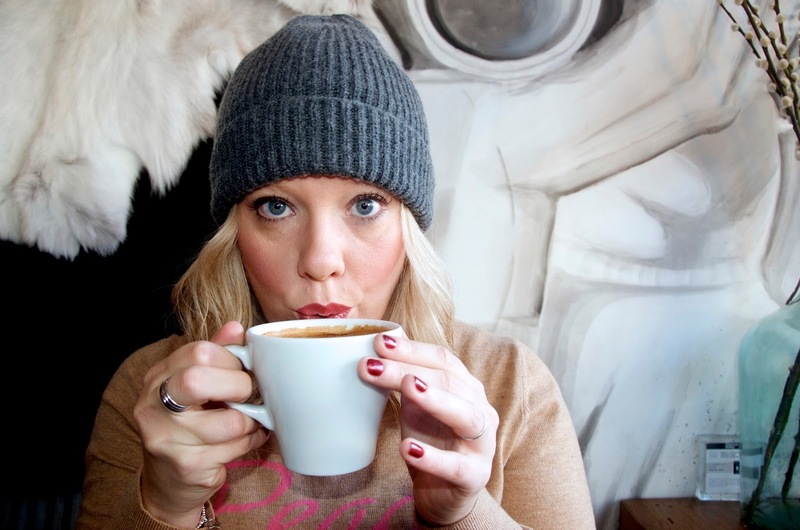 Besides serving up incredible coffee and the best cinnamon buns I've ever had, this little hotspot in my neighborhood is a treat to the senses and a great place to while away an hour or two, fully immersed in Nordic life, if only for the time it takes to drink a cup of coffee. I try to go there at least once every weekend and more often if possible... It's my favorite coffee shop and it's hard not to be addicted to Blåbär's instagram-worthy decor and generally friendly atmosphere. There's so much going on at Blåbär and for those of us living in Putney, it's right on our doorstep. 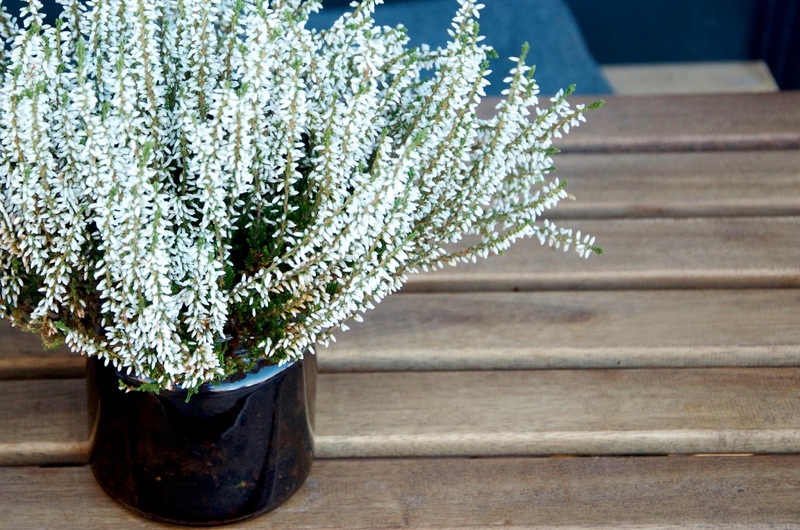 Coffee, specialty teas and cold drinks such as tapped birch waters, still & sparkling water and organic coldpress juices from GreenSwede are on offer. In my opinion, Blåbär serves up some of the best coffee in London and if you're visiting during the holiday season, be sure to ask for the Cardamom blend - it's an absolute treat for coffee lovers. Blåbär also observes the Swedish tradition of Fika, which involves having something sweet with coffee. A selection of sweet treats is readily available including cinnamon buns, chocolate balls, sugar-free blueberry oat squares, honey, banana & pecan slices and cookies. The cinnamon buns are picture perfect and taste even better than they look with delightfully gooey centers that make you want seconds. 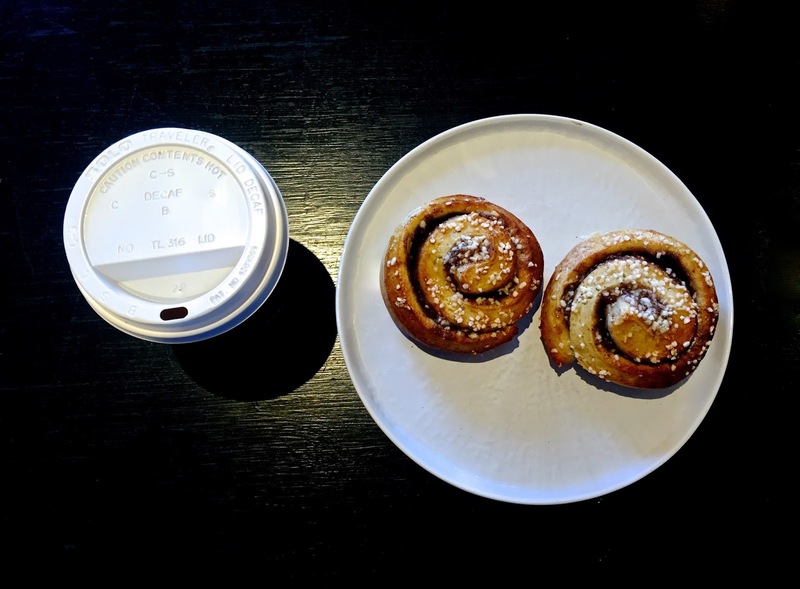 It's pretty safe to say that I am very much on board with Fika - who wouldn't love a sweet bite to complement a delicious, hot cup of coffee? Additionally there's a very healthy menu of Swedish inspired dishes for breakfast, brunch or lunch featuring traditional fare such as gravadlax, an Icelandic yoghurt pot with homemade banana granola & berries, salads, open top sandwiches and even some more British inspired treats with a Scandi twist like a spelt & coconut scone served with coconut yoghurt and jam with a pot of tea. There are always options for Vegans and vegetarians available as well. Whatever you decide to nosh on, be sure to treat yourself to a cinnamon bun to go with it... You can thank me later! Blåbär isn't just any coffee shop - it's a fully interactive experience with products and design surrounding you for a truly Nordic experience. If you see something you like, just ask... Chances are it's available to buy. 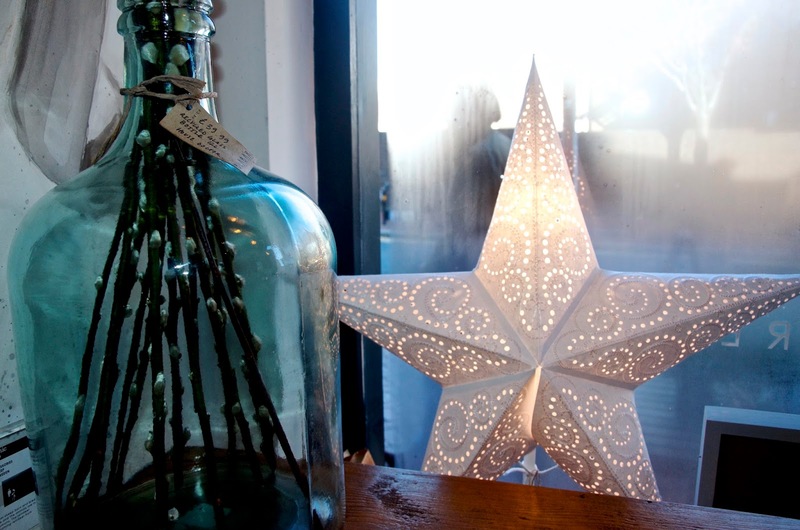 From candles and stationery to kitchen kit and lush furry textiles, you're sure to find something you can't live without and don't forget to look up... 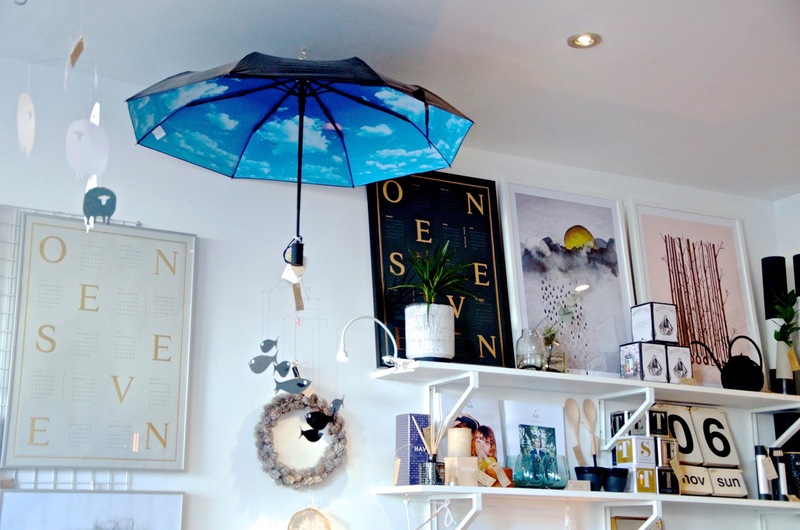 It might very well be hanging from the ceiling in the form of a chic umbrella or a lovely mobile that adds a minimalist touch of whimsy. Fashion fanatics will be obsessed with the stunning range of jewelry on display and homebodies won't be able to resist picking up the Scandikitchen Fika & Hygge Book, a lighting fixture that could only be described as artsy or even a chic House Doctor black handled wooden spoon to add a chic Scandi touch to the kitchen. It's hard to decide where to sit when you visit Blåbär... There are seats outside that provide perfect people & dog watching opportunities and if you get a little chilly, not to worry... They have blankets available. While I normally prefer sitting outside for a coffee when the weather is nice, I also love to head indoors when I visit Blåbär because the atmosphere is just so cozy welcoming. The people who work there are so friendly, not to mention super stylish and the people who frequent the coffee shop are equally chic. The decor is flawless with fashion & art prints along the walls and beautiful photographs of Nordic scenery alongside black & white perfection almost everywhere you look from the tables to the floor tiles. Even the loo is minimalist in design, with a sign where the mirror should be that simply says "You look fine!" and hand soap from the Danish beauty brand Meraki on the sink. It's hard not to feel like you've been on holiday after an hour inside this amazing little Putney establishment... It's a refreshing oasis from the hustle & bustle of London, but you don't have to take my word for it. Blåbär was featured as the Elle Decoration Interior of the Week recently and in my opinion, it's very well deserved. If you don't live in Putney or London, not to worry... Blåbär has an online store offering an ever evolving collection of Nordic products and they deliver across the UK and Europe. Each item is handpicked from up and coming Nordic designers to meet the standards of Blåbär and reflect their mission of quality, craftsmanship and timeless design. 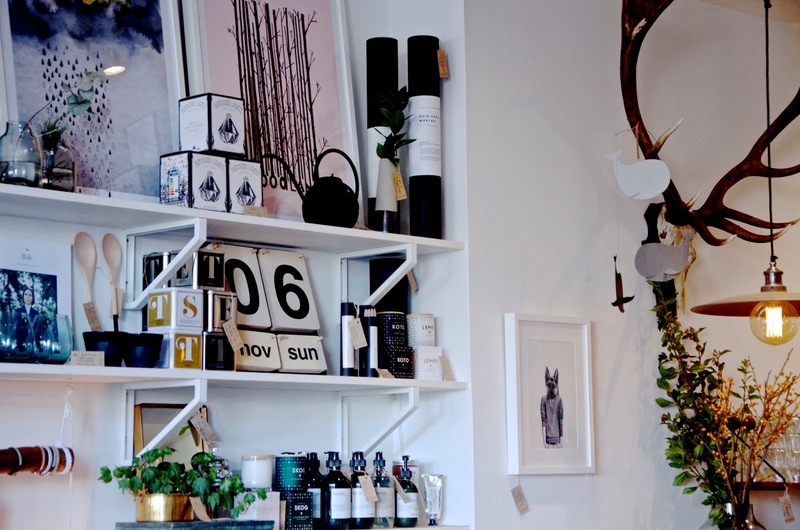 You can even pick up some coffee and tea for your own Nordic experience at home... Bring on the Hygge! As if that's not enough, Blåbär also hosts a variety of special events including Northern Lights Music Sessions that feature different musicians each month, late shopping evenings with Glögg (similar to mulled wine) for Christmas shoppers and other various Nordic themed events & celebrations throughout the year. 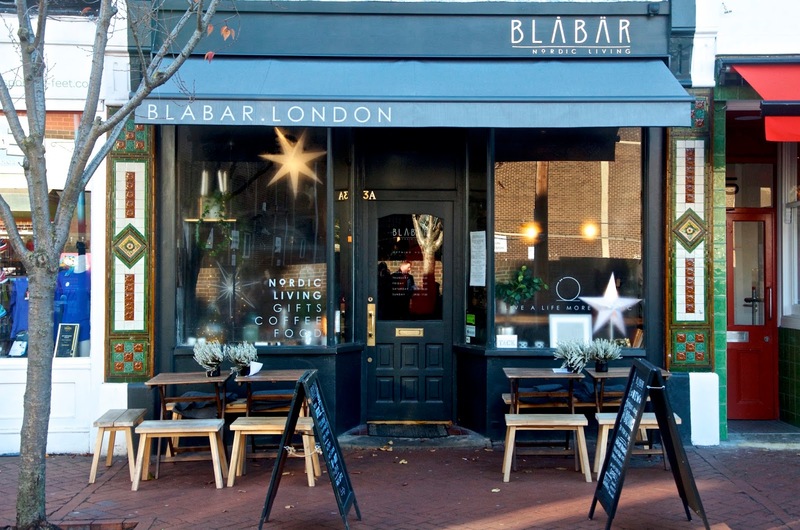 Blåbär is conveniently located just off Putney High Street, around the corner from The Putney Exchange at 3A Lacy Road, SW15 1NH and it's open 7 days a week. The nearest tube stations are East Putney & Putney Bridge and it's just steps away from Putney Train Station.